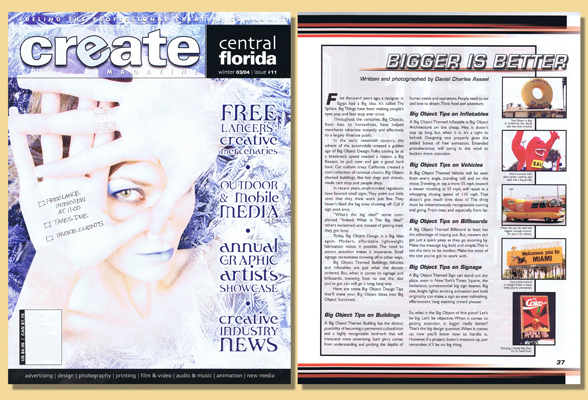 Create Magazine, 3/04 - AAI | Assael Associates, Inc.
Five thousand years ago, a designer in Egypt had a Big Idea. It’s called The Sphinx. Big Things have been making people’s eyes pop and feet stop ever since. Throughout the centuries, Big Objects, from hats to horseshoes, have helped merchants advertise instantly and effectively to a largely illiterate public. In the early twentieth century, the advent of the automobile created a golden age of Big Object Design. Folks tooling by at a breakneck speed needed a reason, a Big Reason, to pull over and get a good hard look. Car culture crazy California created a cool collection of colossal classics. Big Object themed buildings, like hot dogs and donuts, made cars stop and people shop. In recent years, small-minded regulators have favored small signs. They point out little ones that they think work just fine. They haven’t liked the big ones showing off. Call it sign post envy. “What’s the big idea?” some complained. “Indeed. What Is The Big Idea?” others exclaimed, and, instead of getting mad, they got busy. Today, Big Object Design is a Big Idea again. Modern, affordable lightweight fabrication makes it possible. The need to attract attention makes it imperative. Small signage necessitates showing off in other ways. Big Object Themed Buildings, Vehicles and Inflatables are just what the doctor ordered. But, when it comes to signage and billboards, knowing how to use the size you’ve got can still go a long, long way. Here are some Big Object Design Tips that’ll make your Big Object Ideas into Big Object Successes. A Big Object Themed Building has the distinct possibility of becoming a permanent cultural icon and a highly recognizable landmark that will transcend mere advertising. Such glory comes from understanding and probing the depths of human needs and aspirations. People need to eat and love to dream. Think food and adventure. A Big Object Themed Inflatable is Big Object Architecture on the cheap. Hey, it doesn’t stay up long, but when it is, it’s a sight to behold. Designing one properly gives the added bonus of free animation. Extended protuberances will swing in the wind to beckon more attention. A Big Object Themed Vehicle will be seen from every angle, standing still and on the move. Traveling, at say, a mere 55 mph, toward a viewer traveling at 55 mph, will result in a whopping closing speed of 110 mph. That doesn’t give much time does it? The thing must be instantaneously recognizable coming and going. From near, and especially, from far. A Big Object Themed Billboard at least has the advantage of staying put. But, viewers still get just a quick peep as they go zooming by. Make the message big, bold and simple. This is not the time to be modest. Make the most of the size you’ve got to work with. A Big Object Themed Sign can stand out any place, even in New York’s Times Square, the bodacious, quintessential big sign heaven. Big size, bright lights, exciting animation and bold originality can make a sign an ever refreshing, effervescent, long standing crowd pleaser. So, what is the Big Object of this piece? Let’s be big. Let’s be objective. When it comes to getting attention, is bigger really better? That’s the big design question. When it comes up, now you’ll know how to handle it. However, if a project doesn’t measure up, just remember, it’ll be no big thing. The Object is Big! In California, the whole idea has been around. Don’t monkey with plain vanilla, nothing says Sale! like a big gorilla. What can you do with the biggest sausage around, but put it on wheels. Got a little behind in design? Make it show what you’ve uncovered. Enjoying a Really Big One, It’s So New York!